Home>New Songs>Saba Songs> Saba Flips Drake On His "Nice For What Freestyle"
Chicago rapper and Chance The Rapper collaborator, Saba, has been on his grind for a while now. His latest effort however, is a simple freestyle, done over the catchy Murda Beatz production from Drake's recent single, "Nice For What." While the original song cared more about bounce and energy than hard bars, Saba takes a different approach. Instead, he chooses to drop some rapid fire lines which gives the song a much different feel than how it sounded originally. Saba first came to prominence after featuring on Chance The Rapper's Acid Rap mixtape, and recently dropped a project of his own in Care For Me. Check out his "Nice For What Freestyle," and follow up with those projects if you like what you're hearing. 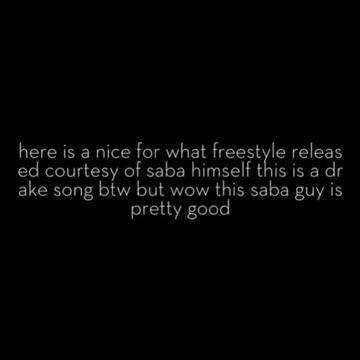 SONGS Saba Flips Drake On His "Nice For What Freestyle"